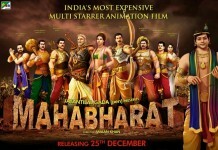 Blog To Bollywood presents the theatrical trailer of the most expensive Bollywood animation film Animated Mahabharat in 3D. It is produced by Jayantilal Gada, Kushal Gada and Dhaval Gada and directed by Aman Khan. While being presented under the banner of Pen India Pvt. Ltd.
Mahabharat, one of the great epics of Hindu mythology, has ruled the Indian television for over two decades in the form TV series but now it is being made as a full movie and that too in animated version. It is slated for December 25 release. The trailer looks great due to the presence of voices of Bollywood’s top stars. But if we also take a look at the animation quality, it is not appealing enough.However it will be an interesting fact to see if in 3D this animation looks better !